Home > Home > Here Now! 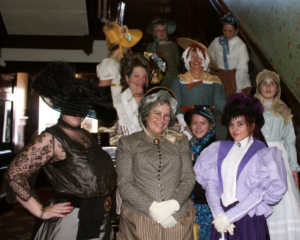 The Buffalo Gals costumed interpreters! Need a beautiful and historically accurately dressed woman to hand out flyers on the street? Sing on the street corner? Tell people the history of your building? Want a full fashion show? We’ve been performing as a group all over the area, and the excitement is spreading. These are women who have experience in the performing arts – each with an area of expertise – plus years of work in the tourism industry. Contact Suzi today via the web contact pages to find out more about shows or interpretation projects. Hourly or contract. Cody, Wyoming region and will travel outside the area by agreement.